Green takes a whole new meaning at Small Kine Farm, Oʻahu’s only organic mushroom farm that has developed a profitable business by living religiously by the three R’s: reduce, reuse, recycle. Nestled along the winding backroads of Waimānalo, Small Kine Farm grows portabella mushrooms by taking carbon-packed organic waste – think food scraps, wood pallets, scratch paper, garden weeds and lawn clippings – and brewing it into nutrient-rich, heat-pasteurized compost. 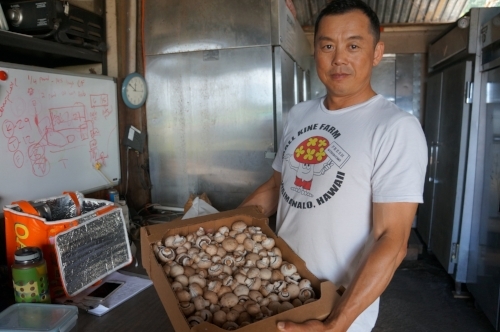 From there, owner Fung Yang is able to create the ideal environment for his portabellas and maintain a circular production model that results in zero waste. Yang wasn’t always a mushroom whisperer. Prior to opening Small Kine Farm, Yang owned and operated a recycling business called Oahu Community Recycling, where he spent over a year diverting aluminum cans, glass bottles, paper and other recyclable goods away from Hawaiʻi’s congested landfills. However, Yang began to notice overtime that his clients were tossing more organic waste into their bins than recycled goods. After seven years of research and trial-and-error, Small Kine Farm was able to grow its infrastructure and produce thousands of pounds of local mushrooms every month using its high-quality compost. The growing process is certainly no easy feat and involves heavy manual labor, constant monitoring and a high risk of crop failure. Yang shared that for even one mushroom to grow, he must wait approximately 60 days. Despite the odds, Yang is proud of his operation and his ability to transform waste into a high-value product. Small Kine Farm reaches the consumer’s plate by selling their organic mushrooms to local restaurants, grocery stores and community supported agriculture (CSA) programs like the Hawaii Agricultural Foundation’s Local Inside. For more information on Small Kine Farm, visit www.smallkinefarm.com.